Dollar gained momentum after the FOMC meeting minutes and today ADP employment report from the US will be released. 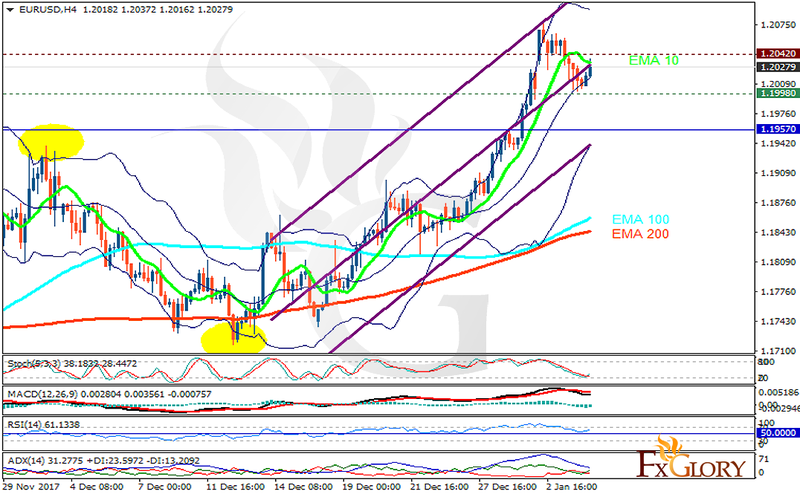 The support rests at 1.19980 with resistance at 1.20420 which both lines are above the weekly pivot point at 1.19570. The EMA of 10 is moving with bearish bias in the ascendant channel and it is above the EMA of 200 and the EMA of 100. The RSI is moving above the 50 level, the Stochastic is showing upward momentum and the MACD line is below the signal line in the negative territory. The ADX is showing buy signal. Despite EURUSD effort to decline, 1.19 level is a strong support area therefore, long positions are recommended towards 1.21.